Many thanks for providing the steer on the intakes. You're insight into the intake sizing makes complete sense to me and helps explain what I found. 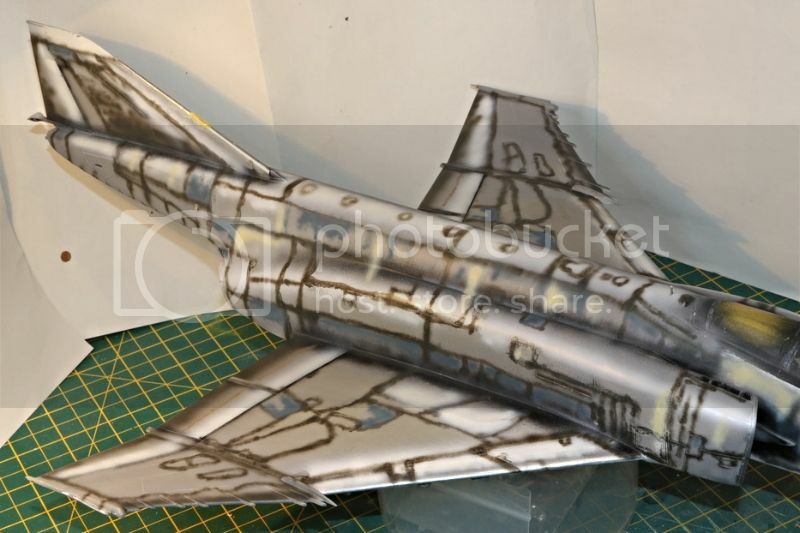 The lower fuselage and wing is now secure to the jet and I will add the top wings shortly when I work out the sequence of events to get the lighting optics and wing tips on at the same time! 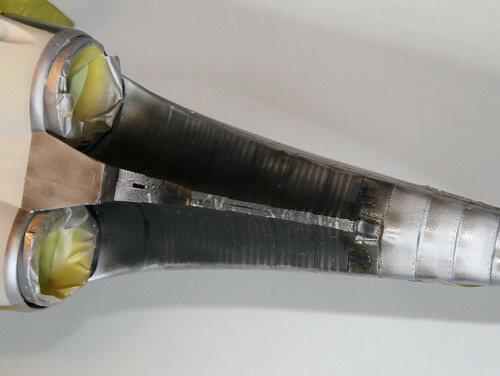 Thanks also for the tips on blending the lower fuselage into intakes, I was coming round to the same conclusion. Will post when I get that far to show how it worked out. 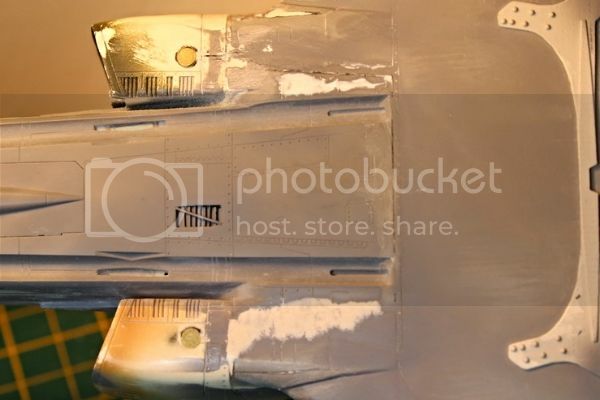 PS - I'm liking this Revell kit a lot but your AM stuff really makes a huge difference to the correct look of the aircraft, please keep up the excellent work! So the build is starting to come together now - almost a year to date since I started! Never thought it would take this long but then life just gets in the way. So the wings are on complete with adjusted anhedral (I think that's the right way) using bespoke cardboard guides. 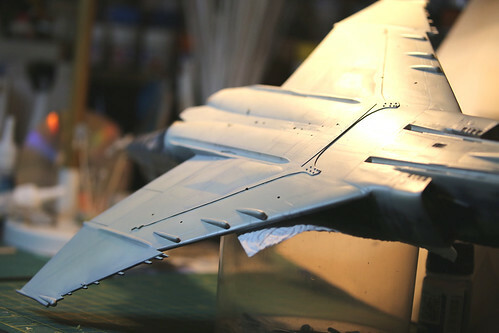 The hardest part was gluing it all at once because of the need to track the fibre optics to the wing-tip lights. A bit fiddly and I'm not sure if I shouldn't have used LEDs as the lights are not that bright with just the fibre optics. Oh well next time. 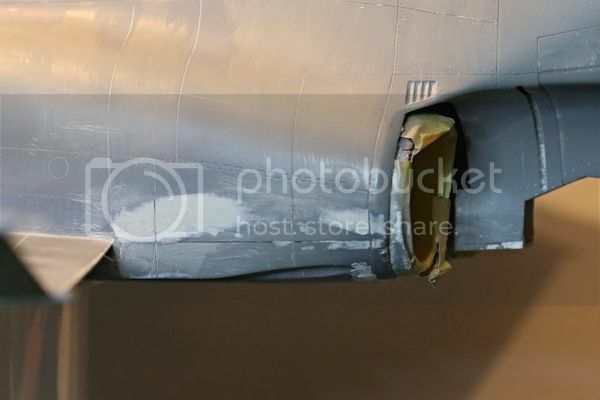 With those in place I could finally tackle the intake join and rear fuselage area which had not quite lined up as I'd hoped due to my much-adapted rigging to ensure the engines were strong enough to take the weight of the aircraft. Anyway, following on from Gary's advice, the results were not too bad. Where the kit parts had overhang I used super glue to give the part some hold then filed it to within an inch of its life. Seemed to do the trick! 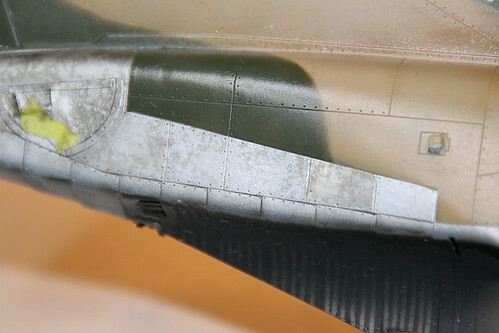 The rear fuselage is a bit of a pain to join up neatly, especially with my internal reinforcements. Still nothing superglue and putty can't resolve. 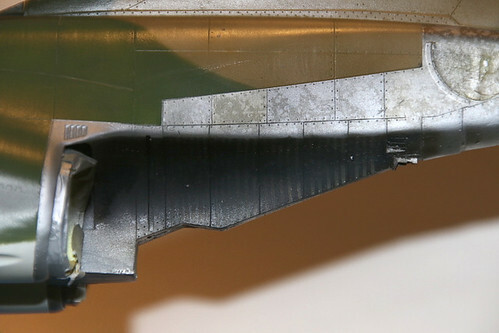 I also thinned down the rear edge of the wings and re-worked the fuel dumps. Next up is re-scribe, prime, re-scribe, prime, re-scribe ... you get the picture. 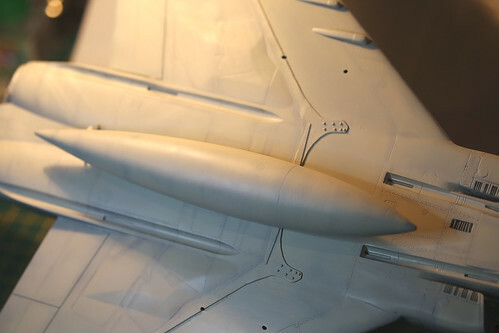 The outer mainplanes (wings) have diahedral and the tailplane has anhedral on the Phantom. Hope this helps. Thanks for the steers Victor, diahedral it is! I think I'll have to remember that as Anh (edral) for 'anging down. Moving on, never realised there were so many panel lines on this thing! By the way on that last shot you can see some of the panel bashing I've tried to incorporate so its not dead flat. Time (and a few coats of paint) will tell if its effective or not. Happy New Year everyone, hope you had a great holiday! I managed to complete 0 (that's zero, nil, zilch) kits in 2016, mainly due to the work required on this one. My resolution is therefore to finish at least one (hopefully this one) as I acquired two more kits during Christmas which means my collect to complete ratio is heading completely in the wrong wrong direction! I'd give you the actual ratio but the maths ends in a division by zero error. 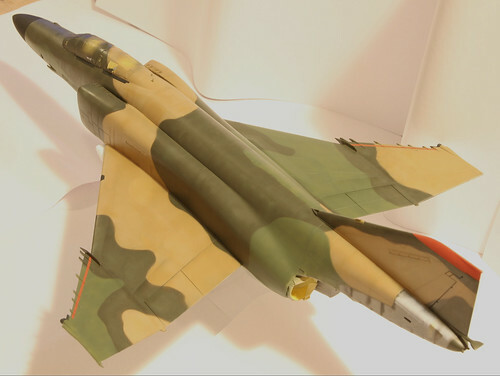 However, the good news is that I had some extra time to take this F-4 kit forward. 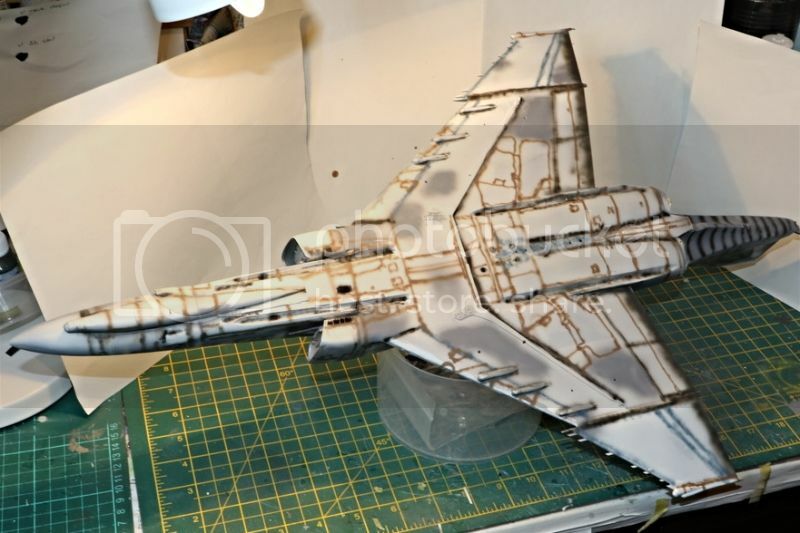 I managed to complete (well as far as I thought was necessary) all the rescribing and priming though I suspect there will be some areas where I wish I'd spent more attention. Then finally it was time to paint. First up was the pre-shading. 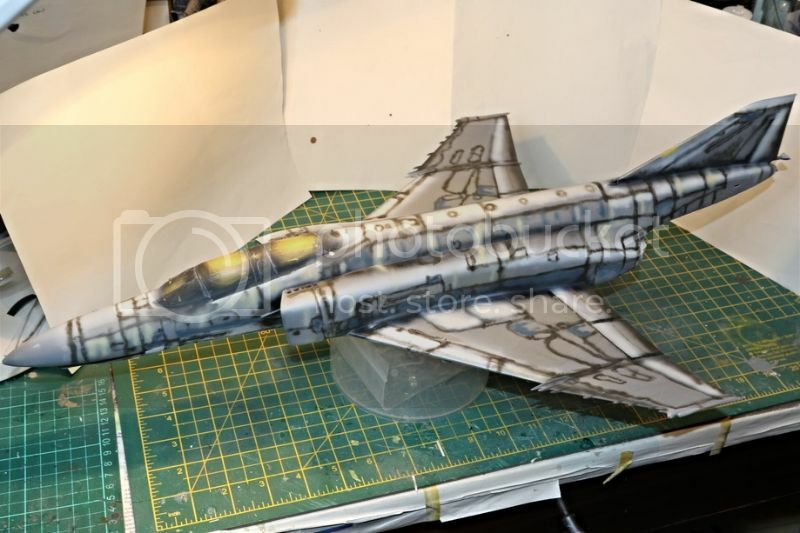 Having not used the airbrush in anger for some time it took a while to get both paint mixture and line straightness back into acceptable parameters. Even still some lines look like I've had a little too much Christmas spirit. Anyway, I think its better not to have too straight a line as it adds to the charm of the model. The top surface took the longest as I've added shadow and highlights to relevant parts in the hope that they will still be present after the main colours are on. I used slightly different colours on the bottom as its a lighter top coat, and for variety. The blue and tan colours are to try and break up the tone a bit as black and white tends to keep the same colour hue. I've also added some silver to the leading edges in anticipation of doing some chipping, though this is a relatively new technique for me. Error #10 - Don't fill your airbrush paint cup too much or you'll end up spilling it on the model. Where I'd added too much paint a bit of light sanding restored a degree of order. Ah well, it all adds to the flavour. 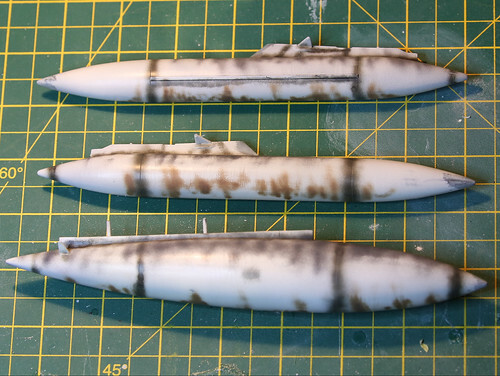 Next job is to add some pre-shading to the fuel tanks and ordnance before starting on the top coat. Lets hope I don't manage to cover up all the work I've just done! Very interesting pattern. Looks very good! While for the airbrush paint cup - that`s why i always try to not forget to cover it with the lid. Great tip thanks! Though I'm not sure if my Badger airbrush came with a cap - will have to go searching now. As for the pattern, it will be interesting to see how it works out under a layer of paint or 2. Colour looks right and it goes on very smoothly, plus I remembered to not overdo it and cover over all the pre-shading. I did the other items such as the drop tanks and just had to try it out for size. It took 2 sessions just because its a big kit and I have a small spray booth but I'm happy so far. I'll probably add some more tonal variation when I pluck up the courage. Next up is the topside SEA scheme, time for the blu-tac! 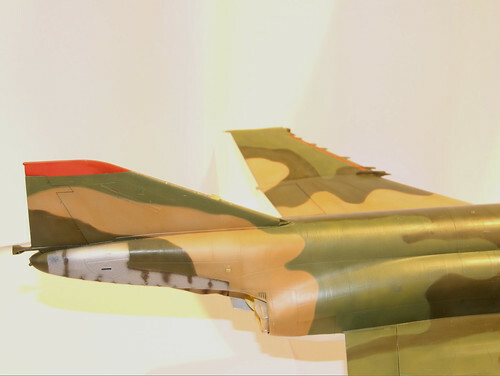 After what seems like 2 months, we have a (mostly) painted F-4E! I've yet to tackle the metal areas eg tailpipe area, which I'm still working out a strategy for but Alclad features heavily. 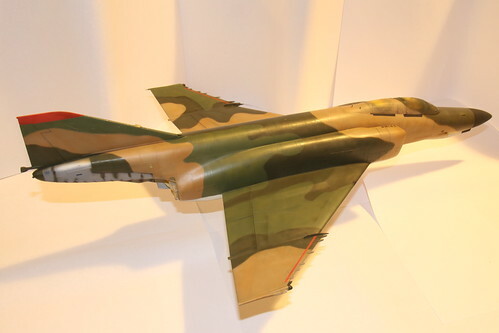 I mainly used the AKAN paints for Vietnam era jets apart from the dark green which I though was a little too light. Once I got the consistency right they sprayed well and were quite robust. 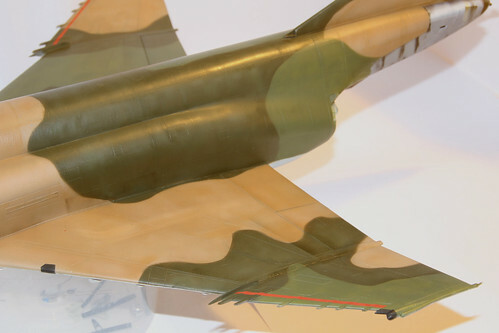 I actually used a different mid-green initially (Mig Ammo I think) but this was a bit bright. In over-spraying it with the AKAN colour it generated a nice two-tone effect which I might try on another project. Sometimes the same colour from a different manufacturer provides enough tonal variation to add interest by overlaying one with the other. It took 3 sessions to get the top colours down plus numerous touch-ups (mostly due to my lack of patience/skill) and post-shading. The pre-shading therefore didn't really work on the darker colours, well not for me at least! 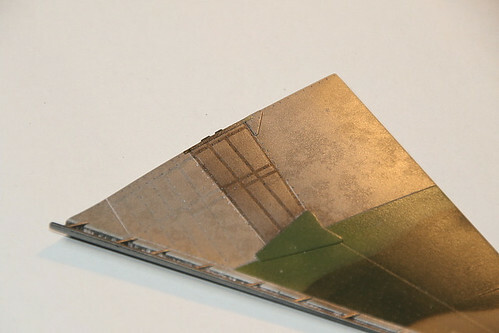 Error #11 â€“ I used True Metal wax colours on some of the leading edges as part of my plan for generating chipping. It works well except for the fact that any over-spraying with paint is quite easy to lift off with masking tape (and I used a lot of that) as the paint does not adhere that well to it. Error #12 â€“ I may have overdone the panel bashing a bit in some areas but this is only really noticeable in a strong light otherwise it adds to the appeal in my eyes. 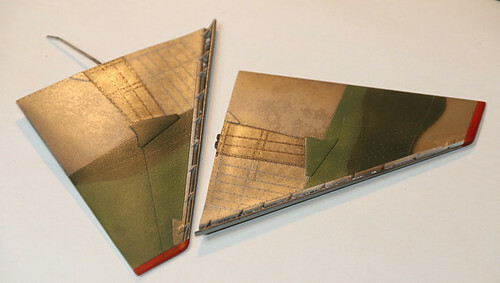 Error #13 â€“ I managed to knock one of the rear wingtip lights off (man this is a big model) which now adds to my growing list of scratch built items. As a result of the pre-shading not coming through very well, I emphasised some of the panel lines with smoke and darker colours of the main colour. I also lightened some panel areas and where light naturally creates a lighter tone ie tops of curves. I'm not a great fan of exaggerated panel-shading so the effects were kept subtle. Overall, I'm quite happy with the end result. Next steps are to do some chipping, polishing and sealing with gloss varnish before painting the metal areas and then the decals! Man o man that looks awesome! With weathering and panel line washes this will be a beauty. Excellent stuff. Love reading the great detail you give on each session! This is really looking stupendous. How soon before we can see it lit up in the dark? I wouldn't mind some additional details in the fiber optics you're installing. I really can't wait to see what they look like. Unfortunately you won't see the lights in action until I unmask everything which is pretty much at the end of the project. Let me know if you have any specific questions on the lighting otherwise I'll try and cover it a bit more when its up and running. Needless to say, I'm looking forward to that moment as well, just hope its all still working! My how time flies! Having painted the camo I thought I'd have a go at the back end metallic bits. 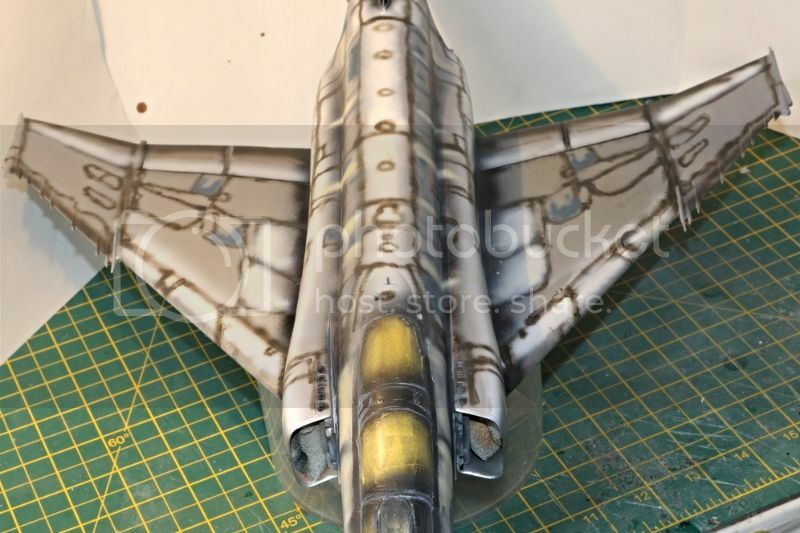 They are quite distinctive on the F-4 and didn't look easy to replicate so I thought I'd try a few firsts, which is always risky on a project of this scale! Having masked the model better than a 'pass the parcel' at a kids birthday party I used Alclad to provide a base Dull Aluminium colour. Luckily it didn't show up too many imperfections as metallic paint will often do. I then added a bit of tonal variation with other shades including Burnt Metal, Steel and Dark aluminium. Many people have masked off the additional areas around the rivet lines which I believe was anti-corrosion activity. The effect is quite neat so I thought I'd have a go. Must admit that it took a while to mask and spray the different colours to get the contrast but it certainly adds interest! The other interesting bit was how to replicate the almost ribbed banding that occurs where the jet efflux is. 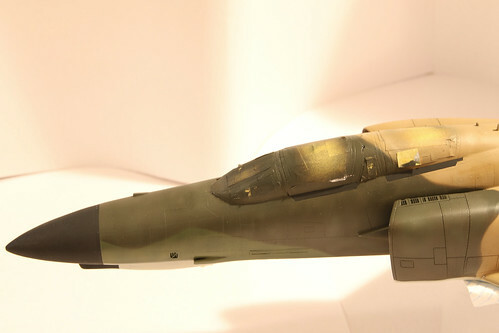 I saw a neat idea of using masking tape to provide thin demarcation and spent a fair bit of time masking a load of (hopefully) parallel lines symmetrically on both sides before spraying some Tamiya Smoke over the unmasked areas. Once this had dried I unmasked the whole ensemble and over-sprayed with NATO Black for the exhaust stains. The banding showed through enough to make the effect interesting and at least justified the time spent in getting all the thin masking to line up. Having â€˜boldy gone' so far, I decided to risk abject failure and try my first attempt at salt weathering to break up the metallic tone. This is rather novel as I wasn't sure whether to overspray the salted areas in a darker or lighter colour. In the end I tested overspray with Tamiya Smoke and the effect looked good so I went with that. It's not as easy as you think to get salt to stick on a smooth metallic surface as the water tends to pool, but with a bit of trial and error I managed a general sprinkling that I thought would work and hit the Smoke. I'm never sure when to stop spraying the thinned Smoke as it always seems to catch you off guard by changing from subtle to overdone in a few passes. So you never know if you've done enough or too much until the salt comes off and at that point its really difficult to put the salt back exactly as it was before! Anyway I gambled that I could always overspray Alclad or remove with thinners if I slightly over did it. I have to say that I really like the effect though I probably went a bit strong in places. I'll try to blend these areas in a bit more before decaling but I will definitely use salt weathering again. Salt is also a bit of a b***r to clean up as I've noticed in a couple of these piccies! 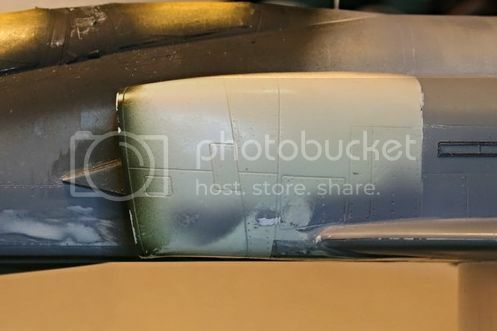 I've left some masking on the tailplane actuators as I'm going to weather these a bit more and I didn't want to mask them twice. Lots of firsts but luckily the combination seems to have paid off and I'm happy with the results. I think it's time to add the decals and start bringing this bird to life!